They call it the one-armed bandit. That is, when it doesn’t go by all its other monikers. The Scots fondly name it “puggy”, the Brits went for the unimaginative designation of “fruit machine”, the Japanese paid homage to their native game pachinko by calling it “a pachisuro” while the far-flung Australians and Kiwis, as always, twisted the word to a silly stub- “the pokies”. However, behind the different labels, regional variations, classes and categories, the slot machine is instantly recognizable under the sound of the ka-ching as the gambler hits that life-changing jackpot. A global trademark of any respectable gambling venue, slot machines are pretty much alike. They are big boxes with lights, video screens, poor animation of the Super Mario variety and R2-D2 bleeps and chirps, and reels set in motion by a lever that once gave them the sticky title of “one-armed bandits”. A name rightly attributed to a machine of inglorious past, troubled present and uncertain future that has robbed many blind, leaving many more impoverished, bankrupt, in debt, alone, and addicted over the years. Below we'll follow the historical journey of a gambling device that has been around since the dawn of modern casinos and the outlining of The Strip along Nevada’s desert horizon. Are on-ground slot machines a form of unlawful hypnotism to string punters across the casino rows in a Pavlovian daze of hope and anticipation? How did technology intervene to alter the makeup of this gambling device? And where do old slot machines go when they reach the end of their lifeline? Liberty Bell. Few haven't heard about the iconic emblem of American Independence, scarred by an ominous crack when first rung in the city of Philadelphia. A hundred years after the installment of the ringing bell, on the opposite US coast, Charles Fey of San Francisco named a technological breakthrough after this symbol of victory. The first mechanical slot machine was the Liberty Bell and sported three spinning reels containing five symbols- diamond, spade, horseshoe, heart, and, naturally, a Liberty Bell. To hit the jackpot meant three cracked bells aligned in a row and a grand total of 50 cents, or 10 nickels, returned to the gambler. All the while, the native Bavarian who launched slot machines into trend, Charles Fey, kept busy devising other funky gadgets such as the Klondike, the Three Spindle, the Draw Power, and the draw poker machine. 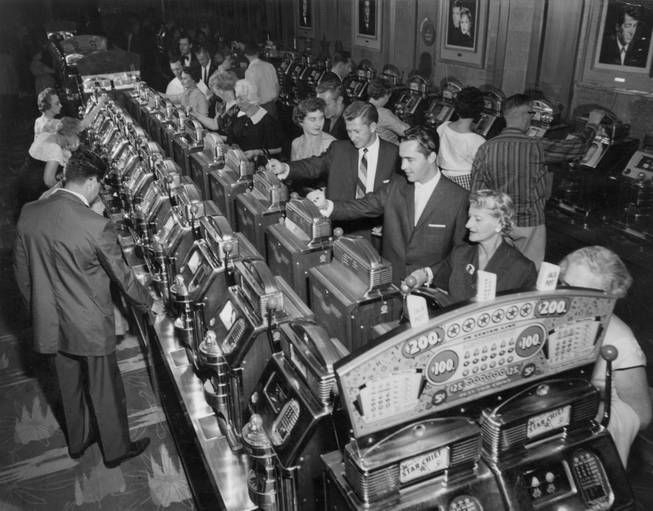 In time, Fey's original reels and lever would become simple decorative elements as the first electronic gambling machines, in tune to America's “big leap” into technological advancement, converted the punters to the button-push and improved the odds of the house. Is the Slot Machine a Skinner Box? 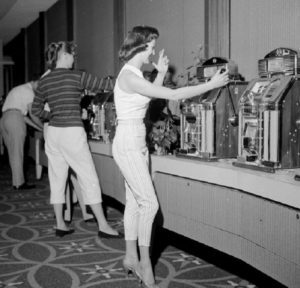 The slot machine boom meant an increase in gambling addiction. 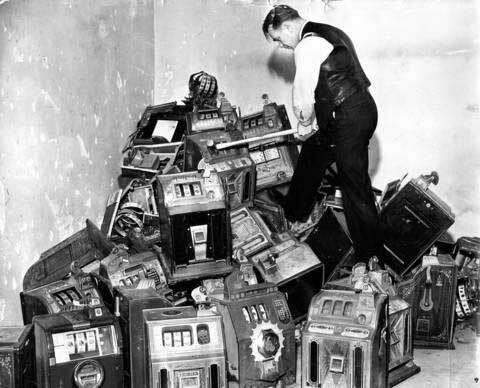 It was the 1930s, after all, and a wailing world war, the Wall Street Crash of 1929, the hoardes of farmers and hobos roaming the inland in the wake of the Dustbowl pushed punters over the edge and over the buttons of these new fruit machines that could get you rich with a bit of luck, or so the rumors circulated. In the same year, a psychologist from Harvard named BF Skinner took a look inside the scope and behavior of a slot machine by way of experiments with rats. In an attempt to prove that free will is a mere illusion and that men can be controlled with the push of a button, the professor designed an operant conditioning chamber, or the Skinner Box, in which he placed rats and engaged them in a race for cheese. The box was dotted with a tube and a button. The small rodents had to press the button to receive food. However, the rules of the game changed and the tube wouldn't indiscriminately deliver the expected grub at the push of a button. Making the shift from a Pavlovian response, the rats were facing uncertainty for the first time. Not knowing if the food would drop or not, they would constantly keep pressing the button with a transfixed stare. If studies on lab rats are any indication, humans will blindly chase that life-changing jackpot and, through a jumble of random payouts and pilling losses, they will still endow the slot machine with an inexistent pattern. The electromechanical Money Honey ushered in a new age for slot machines. It was the 1960s when mechanical poker machines proliferated to Skynet revolutionary levels. Manufacturers had to keep up with the demands of a growingly digital world. On what was to be a balancing act between the wins and the losses, the new internal design of the slot machines began covering a wider range of games from dice, roulette, poker, and horse racing while employing the famous “clustering technique”. That translated to using “a disproportionate number of virtual stops mapped to blank spaces just above or below the jackpot symbols”, as Natascha Schüll's page-turner, “Addiction by Design: Machine Gambling in Las Vegas” reported. It’s the near misses that make one play, plus an enticing swirl of animations, sounds and the game's velocity power, and game designers and manufacturers should be held accountable for playing at least a part in gambling addiction within the existing class and gender disparity, Schüll adds. In the 1980s, Gambling Anonymous were pulling more than their weight as addicted punters fell entranced not to the table games, lotteries, or horseraces previously associated to gambling addiction, but to the slot machines. All the while, manufacturers such as the long-standing Australian gaming designer Aristocrat, set about inventing new, under-the-radar ways to get the comps hammering the machines day and night. One of these was the video multi-line multiplier, a pokie designed to maximize the time spent on the device and cause a surge in the dopamine levels of the addicted brain. There's a psychological hook behind the design of every slot machine. Big Berthas function as attention getters in a casino while 3D consoles appear in ever larger installments in an effort of the operators to win over the Millennials. The rest is history. The player walks into a casino and heads for the slot machine where he or she will spend hours in a hypnotic state as the wins dribble out and the player's money trickles steadily, by law of the house edge, into the casino coffers. Now, let's coin in on a few interesting statistics. How many slot machines are there in Las Vegas? The casinos on the strip hold some of the biggest slot machine counts, but Summerlin, Nevada wins the headcount race by a whopping 2,860 pokies. Good luck sticking to one lucky slot machine as you make your way into the Red Rock Casino, Resort & Spa. Which are the top 5 countries with most slot machines? The answer depends on the connotation you give the question.„Rigged” means that manufacturers are free to turn their devices into Terminators of free will. In the medical world, it's called „intermittent reinforcement”. Legal slot machines will respect the principle of chaos, or the random number generators (RNG) incorporated into their design. Not the manufacturer, the designer, the operator, nor the gambler will be able to forecast or manipulate a jackpot. The algorithms are supposed to be uncrackable and the results of a spin always baffling. However, weighing your chances can be incredibly alluring to the brain as dopamine receives little jolts of pleasure when a reward shapes itself on the horizon. Open the hatch of a slot machine and you'll come across its operating center. Its government-approved brain. A computer software responsible for dictating the terms and conditions by which the slot machine hands you your gains and keeps the house in a fixed mathematical edge. Thus, the pokie is designed to payback 95% of every coin, so the casino will receive 5% of every input in a particular slot (some slots have a 70% payout but the chances of a win run lower). However, this formula is calculated over the long haul. How long, nobody can tell. But it means you won't get your 95% payback in a play, a session, a week, or even a year of hammering a machine. Rather, you might get some of your spending back in an unspecified amount of time. Just be sure not to go broke before those lucky odds get around to schedule your big breakthrough. On the other side of reality, online slot machines carry an advantage or two over their land-based cousins. The gains of the gambler will be proportionate to the much less prohibitive design cost of the games. Plus, digital and mobile gaming is the future, and that's that. Where do old slot machines go? In order to soothe the worries of slot machine nostalgics, we would be more than happy to say that old slot machines take the road to that pretty slot farm upstate, or go up to the pokie heaven. The truth is, some of these cherished legacy slots do end up as vintage decor in the homes of millennials. For other one-armed bandits who can't satisfy the financial demands of the casino or the ever-changing taste of the player, the end of the road is the scrap cemetery. After operators squeeze as much out of a slot as they can, the machines are furtively removed out of the casino at night to be dismantled, sold as scrap, or simply put out of sight in the basement where it will slowly gather the dust of age alongside other bells, cherries, mellons, bars, triple 7s, 3-reel Bally or IGT oldies. If you decide to salvage one, know that most states in the US do not prohibit the purchase of a slot machine with an out-of-order label and a quarter of a century old.